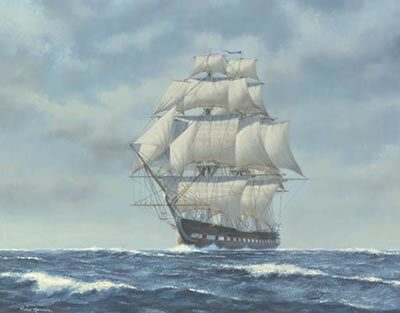 Since it’s founding in 1978, the American Society of Marine Artists has attracted, and benefited from, involvement by virtually all of the nation’s leading maritime artists. Many of these impressive talents also gave their energies and dedication to building the Society, shaping it’s mission, and shepherding it through transitional challenges over the decades. In this gallery we honor those who made an indelible contribution to building the ASMA and the legacy of American Marine Art, adding new members occasionally. After growing up on the waters of Long Island Sound, Lundgren studied at the Parsons School in New York followed by overseas studies in several countries prior to WWII. In the 1960s he brought vision and sustaining help to the newly undertaken South Street Seaport Museum effort and, as such, could be ranked as one of its founders. He retreated from his beloved Sound because he found the water too “distracting,” moving to a colonial farmhouse near New Preston, CT, where he ensconced himself in a cellar studio. Several early meetings of the Society were held there in that smoke filled, windowless room. Charlie was pivotal in steering the Society through the rough waters of its first months and went on to serve as our President for the first two years and as one of our first Fellows. 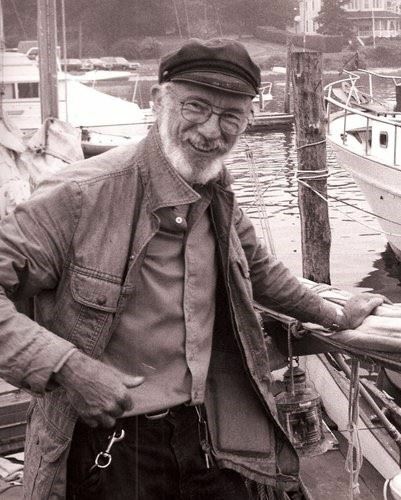 Robert Oliver Skemp was born in 1910 the son of Olive Hess Skemp, a prominent rug designer and artist, and grew up with a love of the sea and the ships that sailed it. A librarian aunt provided books with stories like Treasure Island, 20,000 Leagues under the sea, and Mysterious Island with illustrations by artists like N.C. Wyeth, Meade Schaeffer and others. Skemp would go on to travel the world as a merchant seaman. A colorful character whose prolific skills made him a widely sought-after illustrator, he did everything from Mormon Church murals to dozens of pin-ups. An avid sailor, Bob’s love of ships and painting the sea found him among the Society’s founders, and earliest Fellows. Perhaps America’s pre-eminent marine artist, Stobart’s career was already taking off when in 1978 he wrote to Bill Muller suggesting some sort of marine art organization be created, perhaps along the lines of the Royal Society of Marine Artists in London. Maryanne Murphy, an energetic promoter, was part of Stobart’s world in New York. Peter Sanford knew and was backing Bob and Maryanne Murphy in their Coliseum exhibition while Charlie Lundgren was already working on establishing the South Street Seaport Museum. 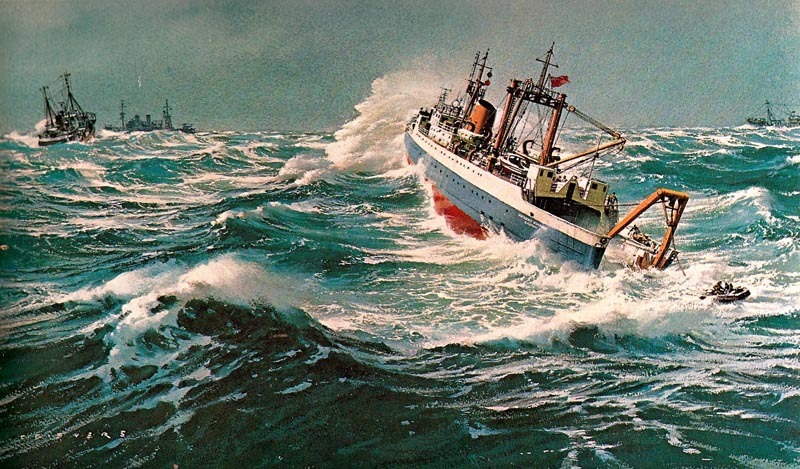 The circle was soon closed and the first crew of ASMA appeared when in March 1978, under the aegis of the National Maritime Historical Society, papers were filed with the State of New York to set up a not-for-profit organization called the American Society of Marine Artists. Stobart served as the Society’s first Vice-President. You will find little argument from artists or collectors by calling Carl Evers one of the finest marine artists of the twentieth century. His ability to capture water in motion, feeling for light, exquisite drawing and incredibly rendered detail give his paintings a vibrancy that few can rival. Born in Germany, schooled at the Slade School in London, his first job was as an automotive illustrator for sixteen years in Sweden. In 1947 he moved to the United States, traveling there appropriately by freighter. 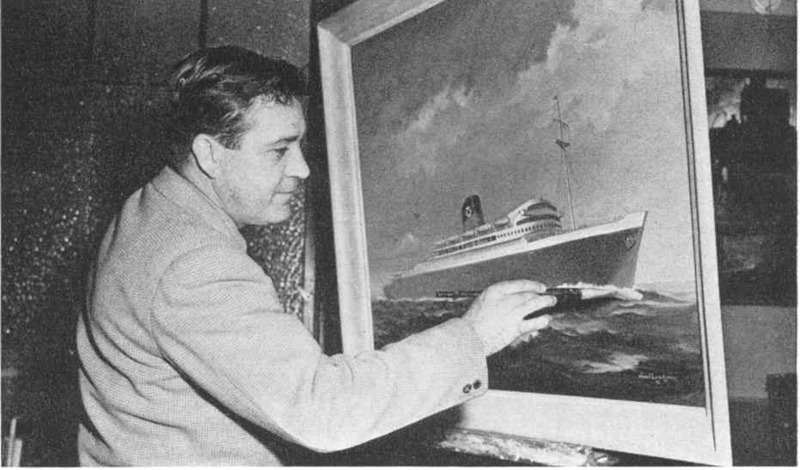 He soon was busy full time painting tugs, liners, freighters and the working waterfront for every major line, including Cunard, Grace Line, Farrell Lines, United Fruit and Moran Towing. He was a Fellow of the Society from 1978 until his retirement in 1995. 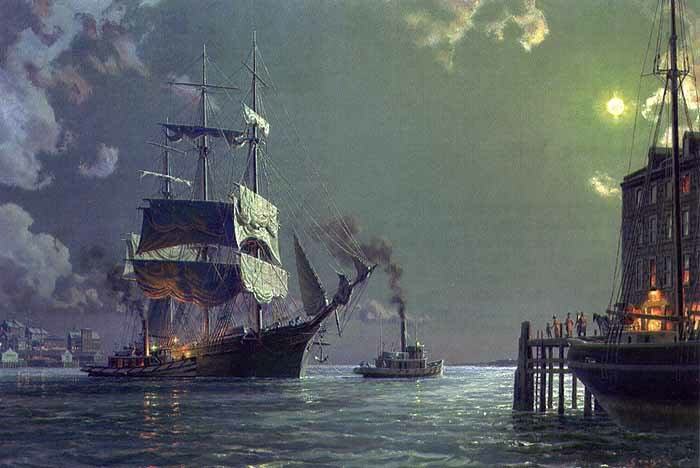 Born in Philadelphia, Greene studied at the Graphic Sketch Club and the Philadelphia Museum School of Art, then worked as an advertising illustrator in New York until 1967 when he began to pursue his bliss – painting ships and the sea. Mark was not only a dynamo, but was battling cancer and losing his eyesight while he determinedly gave his last to getting the Society off the ground. He produced the catalog for the First National Exhibition, served on our first Board and remained on it until 1985. He received the First Iron Man Award in 1980. Born in New York City in 1936, he was exposed to riverboat traffic on the Hudson, eventually becoming a quartermaster on one of the Day Line steamers when he was 18. 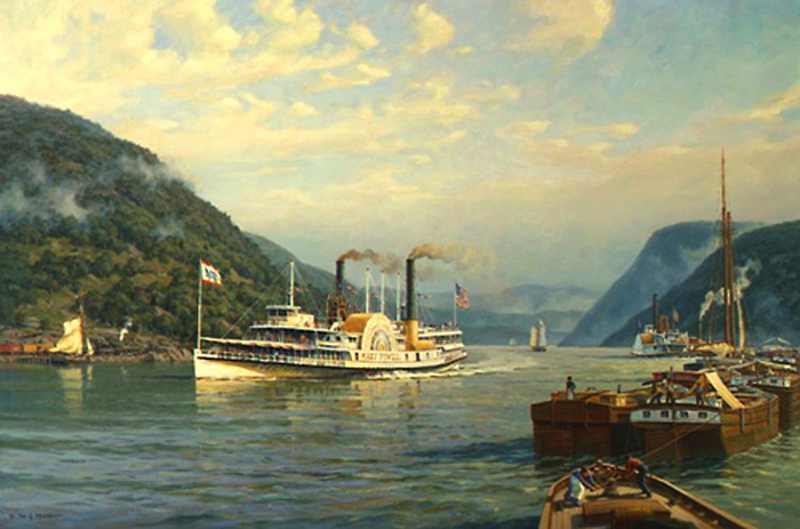 He studied at the Pratt Institute and the School of Visual Arts and went on to work in commercial art – all the while distracted by the Hudson River boats. He is one of the four artists who launched the Society and he served on the Board until 1985. He was one of the first Fellows. True to his love of river steamers, he has also been instrumental in establishing the Hudson River Maritime Museum in Rondout, NY once a thriving port on the Hudson River between Albany and New York City where the Delaware & Hudson Canal brought coal from the mountains of Pennsylvania to be shipped to New York City and points beyond. Brett is a native-born Australian with a yearning for the sea from boyhood. Only when he finished his education studying under the well-known Australian painter John Alcot and his studies at the East Sydney Technical College would his parents allow him to go to sea. From deck hand on coastal steamers to square riggers and ocean liners, he gained first-hand experience of the sea only to eventually settle in New York where he became involved with the South Street Seaport Museum and painted and illustrated. ‘Os’ was usually in the company of the four artists who launched the Society: Charles Lundgren, Mark Greene, Bill Muller, and John Stobart. In this capacity he provided encouragement and though he did not participate further when it was eventually established, his early support was important. Born in 1926, Willard Bond served in the Navy during World War II in the South Pacific. While stationed in Chicago, Bond attended night school at Chicago Institute of Art. He graduated from Pratt Institute in 1949, and spent 2 additional years at the Art Students League in NY. After 15 years of the SoHo scene, Bond shifted his artistic interests back to that of the Sea. He joined ASMA in its early years, and was a Fellow of the Society from 1983 to his death. Quite simply, Bond became the number-one painter of sailing action in the world. 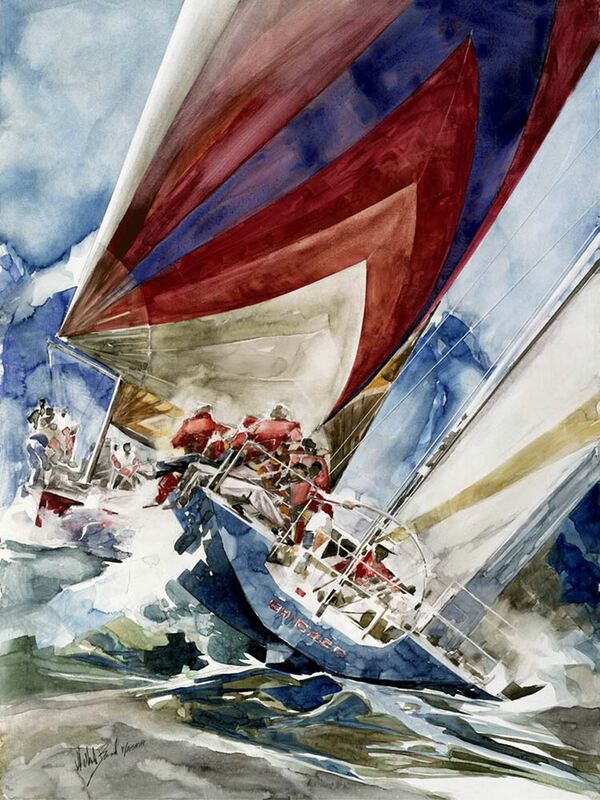 His originals in oil and watercolor won him a huge following among sailing enthusiasts and anyone who loves the excitement of the sea.